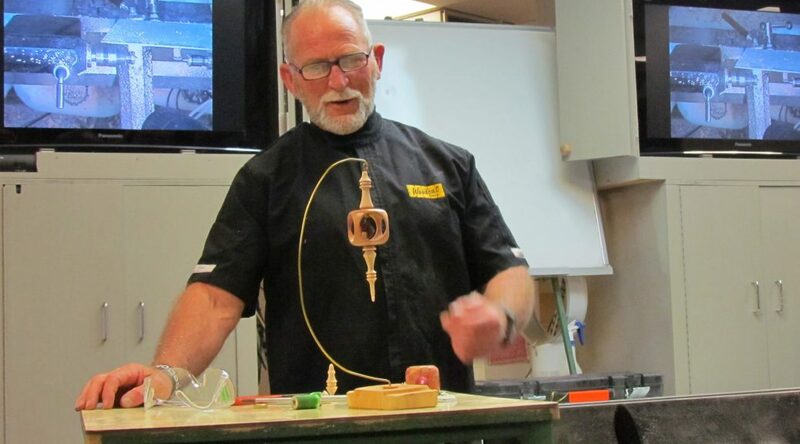 Garry Jones – Christmas Decoration | South Auckland Woodturners Guild Inc.
Garry chose to demonstrate the turning of a Christmas decoration (in his words a doo da) in the shape if a lantern with finials top and bottom. Using a cube of kauri 50×50, but of course you may use any size or material you wish; Garry marked the centres on all sides. Mount in a 50mm chuck with the end grain towards the head and tail stock. Drill a 7mm hole thru the cube to take the finials. Garry then used a 13mm countersink bit to provide a seat for the finials when they are glued in. Reposition the cube in the chuck and drill out the four sides using a 35mm forstner bit. Drill half way through, rotate the cube and drill from the other side to complete the hole, sand the hole to a neat finish as you go. 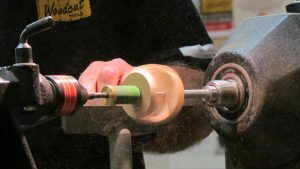 Once the four sides are drilled, the edges have to be rounded. 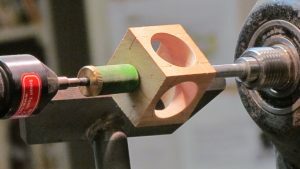 Gary used his own adaption to hold the cube by using his pen mandrel threaded through the finial holes. He added a couple of turned spacers to hold the cube,; worked like a charm. Round the edges/corners using the shadow technique, sand and finish. At this stage, finish the cube with whatever finishing you prefer, sanding sealer, polyurethane etc. To make the top and bottom the finials, Garry started with 20mm doweling, used as a contrasting colour to the kauri. He suggested the top finial at 80mm and the bottom 100mm. Turn the finials to any shape you like, leaving a 7mm tenon and a 45deg base to fit the counter sunk recess left in the top and bottom of the cube. 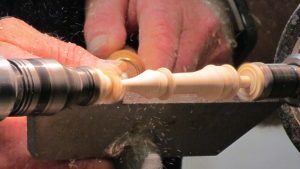 It was suggested from the floor that choosing a hard wood to make the finials would result in a better finish with less sanding required than the pine that Garry used. Finish the decoration by adding a bell to the interior, or let your imagination and creative juices flow.